Rev. Ludwig Otto, DMin, PhD, President & Founder: Ordained to the Gospel Ministry by First Baptist Church, Houston, Texas 1975. The SMU (Southern Methodist University) alumni magazine refers to Ludwig Otto as an “entrepreneur, educator, and evangelist” (Class Notes 2011, 42). The TCC (Tarrant County College) IN THE SPOTLIGHT refers to “Ludwig Otto, Northeast Campus English Professor, ‘Was awarded the Global Peace and Humanitarian Award by the Security Council of Novena University in Lagos, Nigeria’” (Winter 2011, 7). Winner of the 2008 Democratic Primary for US Congress from Texas District 6. Upon completion of your course, simply contact Dr. Ludwig Otto at ludwigotto@sbcglobal.net. We are not affiliated with any church, denomination, or college. Mail only one lesson at a time and wait for a response before mailing another lesson. BCU is an online, computer division of The Ludwig Otto Organization and has no physical location other than this web site. When a student does not complete a degree program and fails to communicate with us for 12 months, their incomplete course records are destroyed. BCU does not offer a Masters degree until a student has completed the Bachelor of Christian Evangelism degree at BCU. BCU does not offer the Doctor of Christian Evangelism degree until the student has completed the Master of Christian Evangelism at BCU. BCU does not accept credits or degrees from other institutions as substitutes for these requirements. The Doctor of Ministry degree (2 year program 100% free) can be earned by Doctor of Christian Evangelism graduates from BCU. The mission of BCU & USCU is to equip Christians to be witnesses for our Lord & Savior Jesus Christ. 2 Timothy 4:1. In the presence of God and of Christ Jesus, who will judge the living and the dead, and in view of his appearing and his kingdom, I give you this charge: 2. Preach the Word; be prepared in season and out of season; correct, rebuke and encourage--with great patience and careful instruction. 3. For the time will come when men will not put up with sound doctrine. Instead, to suit their own desires, they will gather around them a great number of teachers to say what their itching ears want to hear. 4. They will turn their ears away from the truth and turn aside to myths. 5. But you, keep your head in all situations, endure hardship, do the work of an evangelist, discharge all the duties of your ministry. This course was created in 1983 by Dr. Ludwig Otto, DMin, PhD, DCE, Chairman, President, and CEO of Bold Christian University. He has graciously granted us permission to offer this course free of charge, here. BCU has students in Australia, South Korea, Viet Nom, St. Vincent, Swaziland, Japan, Zampia, Benin, Nepal, Russia, Afghanistan,Mexico, Brazil, Singapore, New Guinea, Saudi Arabia, Rwanda, Eritrea,New Zealand, Egypt, Mozambique, Turkey, Cyprus, Zimbabwe, SriLanka, Liberia, USA, Switzerland, Italy, Ethiopia, Nigeria, Mauritus, Peru, Jamaica, Ghana, Botswana, Bahamas, Tanzania, England, India, Pakistan, South Africa, Niger, Germany, Malaysia, Philippines, Togo, Panama, St. Thomas, Spain, France, Sierra Leone, Sudan, Uganda, Kenya, Libya, Canada, Denmark, China and BCU is 100% free. When you complete all of the requirements, simply contact Dr. Otto and request your Christian Evangelism Degree. IF YOU CANNOT GET A RESPONSE FROM BOLD CHRISTIAN UNIVERSITY, WE APOLOGIZE, BUT, AT THIS TIME, WE CANNOT OFFER DEGREES (ALTHOUGH WE ARE WORKING ON THAT). 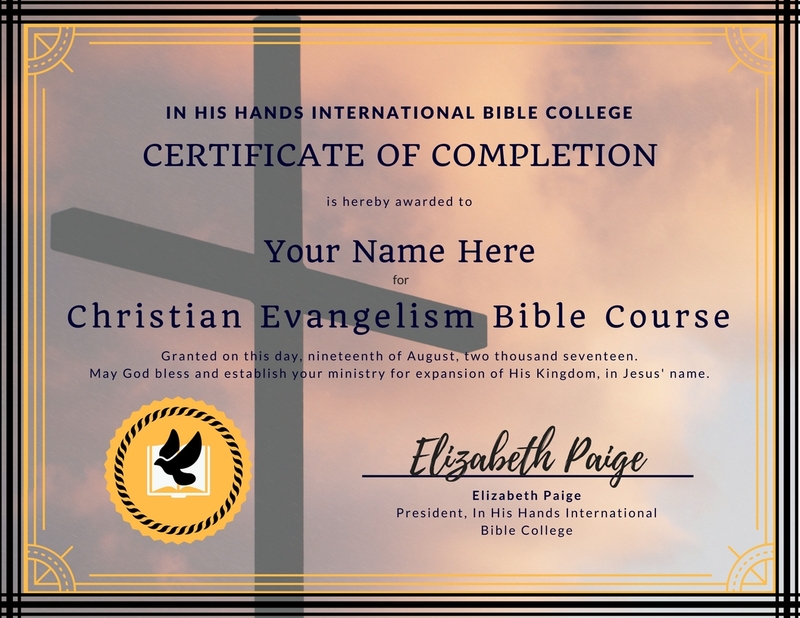 YOU ARE STILL MORE THAN WELCOME TO LEARN THE CONTENT AND GET A CERTIFICATE OF COMPLETION FOR FREE FROM IN HIS HANDS INTERNATIONAL BIBLE COLLEGE. Thank you for growing in God's Word with us! We pray for you that God would do great and mighty things in and through you, in Jesus' name! UPDATE: As of September 1, 2018, we have had some trouble getting a response back from Bold Christian University for students who are trying to enroll directly (recommended) to earn the Bachelor's Degree in Evangelism.